Don’t Let Governor Snyder, Kevyn Orr and Jones Day Sell Out Detroit to Wall Street! Emergency Manager Kevyn Orr and Governor Snyder negotiated a sweetheart deal with Wall Street banks that would increase Detroit’s debt by $350 million, by paying $250 million to Bank of America (a client of Orr’s law firm Jones Day) and UBS (United Bank of Switzerland). Barclays, the new lender, would then have a super-priority lien on Detroit’s assets and income tax revenue. Under this swindle, 20% of Detroit’s income tax revenues, $48 million per year for six years, will be pledged to these banks even after the bankruptcy is completed. At the same time, workers’ pensions are subject to being reduced to 16 cents on the dollar. WE SAY NO TO THIS WALL STREET RIP OFF! 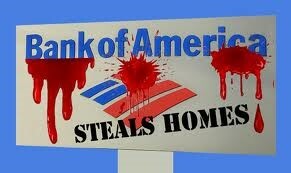 This scam is intended to pay off the interest rate “swaps” Wall Street banksters sold to the City. Bank of America and UBS, two of the main predatory mortgage lenders who destroyed our neighborhoods with massive home foreclosures, and whose executives have been jailed (UBS) and indicted (Bank of America) for their municipal bond crimes, already have pocketed $250 million in profits off Detroit city tax revenues on this scheme, even before this new goes into effect. While City Council unanimously voted this deal down, Snyder and Orr are once again ignoring the democratic process. They have already filed a motion to have this deal approved by Bankruptcy Judge Steven Rhodes. 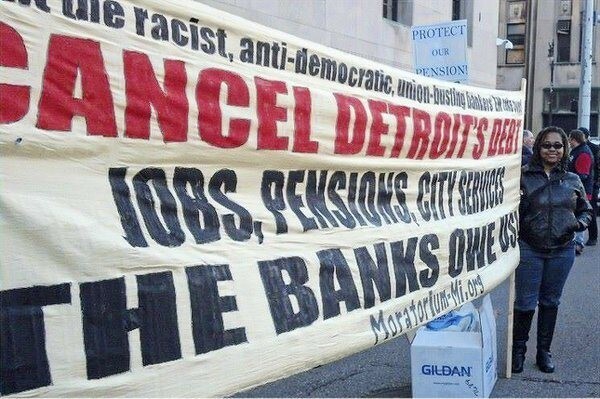 Demand: Wall Street: Cancel Detroit’s debt! The banks owe us! Defend workers’ pensions and City services! Snyder and Orr: You have no legitimacy! We see through your lies and scams! DEMONSTRATE AGAINST WALL STREET AND EMERGENCY MANAGEMENT! Protest outside Detroit Emergency Manager’s private meeting with City creditors – Friday, June 14, 2013, 9:00 a.m.